The brand Samsonite is well known throughout the world for its quality and modern luggage solutions. 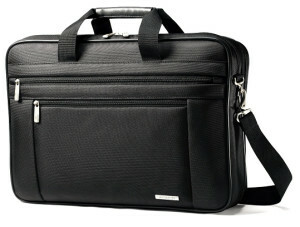 The Samsonite Classic Two Gusset 17” Toploader Laptop Bag is no exception to this fact. If you’re after a laptop bag and briefcase combination that goes with everything, then this might be just what you need. This versatile and formal everyday briefcase has become quite popular for the modern business professional. In this review, I will explore the benefits of this briefcase to help you decide if this one is suitable for your needs. Fits Laptop Screen Size Up to 15.6"
Dimensions (inches) 16.5" x 12" x 4.5"
Constructed from 1680D ballistic nylon (thick and strong material – the best for luggage) with the design as a modern yet stylish everyday briefcase, the Samsonite Classic Two Gusset Toploader has it all – durability, protection, style and as the name suggests, it is a classic. The briefcase is designed to fit a 17” laptop but some people have found they were unable to fit a 17.3” laptop and those that were able to had slim 17.3” laptops (in this case, they were better suited for the more spacious Three Gusset Toploader). However, it leaves little room inside for laptop accessories. The edges on the Samsonite Classic Two Gusset Toploader are framed with solid leather like piping which means the briefcase will keep its shape and stay upright when set down. The briefcase comes in black only but one will never have to worry about this going out of fashion as it will go with anything. It’s also versatile as it can be used for work, casual events and travel. There are 4 ways that you can carry this briefcase – on the shoulder, across the body, by hand or attached to your suitcase. Yes, with the open sleeve on the rear of the briefcase, this will allow you to slide the briefcase over the telescopic handle of your rolling suitcase/briefcase. This is perfect for those who often have to travel for business. The matt metal silver zips are embossed with the recognizable Samsonite logo. It gives this bag a classy and professional look with this discreet contrast. Unfortunately there is no option to use a padlock on either briefcase as there are no holes on the zips to fit a padlock. Unless your padlock happens to be a super thin wired one. The carry handle on the Samsonite Classic Two Gusset Toploader is wrapped in soft leather like material which is a relief as we all know how uncomfortable it is carrying anything with stiff nylon handles. The shoulder strap is padded to make it comfortable to carry on the shoulder. Some users have found it to be quite uncomfortable to carry the briefcase on the shoulder when packed to the brim due to its bulky size which made it awkward and it may slip off your shoulder. In this case, it’s probably more comfortable to carry by the handle. 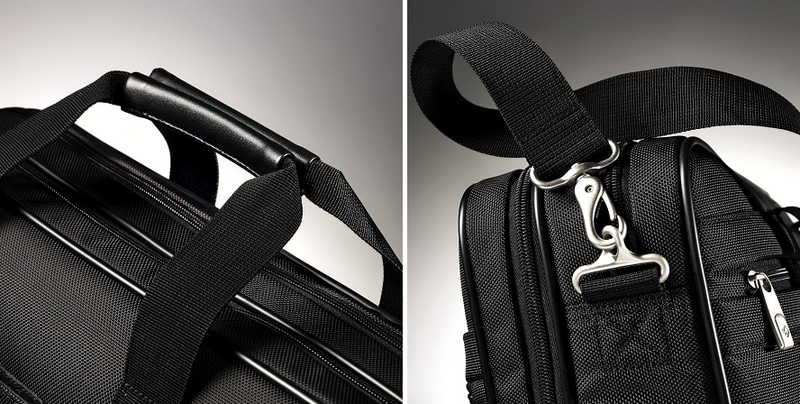 The shoulder strap can be easily detached with the 2 silver metal ring hooks so that you can carry the briefcase in your hands if you prefer. It is easy to remove the strap with a push of the ring hook. It is recommended not to overfill the briefcase as a few users have found that doing so causes the ring hook to pop open thus resulting in the shoulder strap coming off and your briefcase dropping. 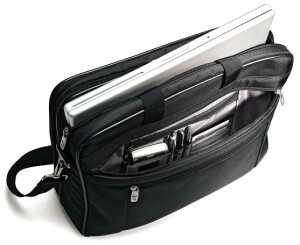 In this laptop briefcase bag, there are 2 main compartments. The front main compartment is separated inside with padding and a secure Velcro strap attached which is for your laptop and the other side has 3 double stitched pockets for your laptop accessories. The zips go down to ¾ of the way. The rear main compartment is also separated inside. Unfortunately, the zips only go down a quarter of the way. The front of the briefcase has 2 pockets. The larger one houses your phone, pens, cards and a small zipped pocket inside which is brilliant as it provides easy access to all these essential everyday items. The other front pocket is smaller and centered which is ideal to quickly store things into such as tissue. 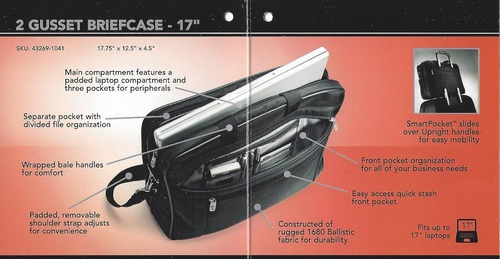 On the rear of the briefcase, as well as the open sleeve for attachment onto a suitcase, there is also a large zipped compartment. It is quite thin though so I wouldn’t recommend putting anything bulky here or it won’t zip up and it will be difficult to pull over your suitcase (if using). I find that the Samsonite Classic Two Gusset Toploader helps with a busy everyday working lifestyle as it is able to fit all your essentials in with its many useful compartments. 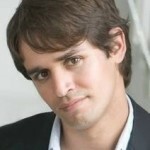 It looks professional which is great for formal use within a corporate environment. 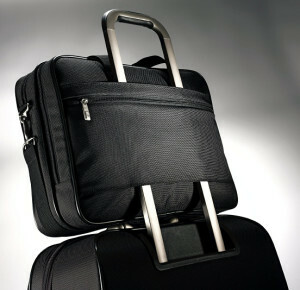 The size is just right to take away on day business trips or on long business trips with your suitcase. It saves from having to bring another professional looking briefcase. If nylon doesn’t tickle your fancy, then take a look at the Samsonite Checkpoint Friendly (leather) which is of a similar size to this briefcase bag. If you like the style and usefulness of this briefcase/laptop bag but you can do with more capacity, then don’t worry because it also comes in a Three Gusset model too.